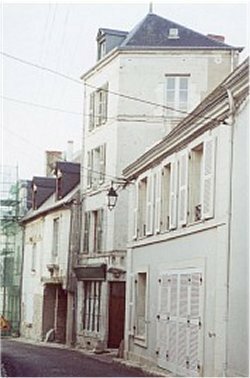 The house is located in a quaint village in the Central Loire Valley, between the Loire and the Cher Rivers and between Blois and Montrichard. Gently rolling hills, vineyards and pastures filled with goats surround the property leading down to the Cher where there is a beach, swimming and boats for hire. The house is less than 20 km from Chenanceaux, Chaumont, Cheverny, Chambord and Blois which also has a wonderful Museum of Magic. This picturesque stone house in the heart of the chateaux country was built in 16th century for the chief clerk of the 11th century Abbaye just across the street where, during the summer, there are concerts by internationally known musicians. Recently, the house was completely renovated and restored: new furniture, bedding, gourmet kitchen fully equipped with (dishwasher, washer, dryer, stove, large refrigerator and microwave) a Moroccan style living room, a terrace, many fireplaces (also central heating). Swimming and boating are 6 kilometers away, cycling, wine tastings, antiquing and many of the best-known chateaux. A perfect holiday spot, both for adults and children. The house was completely renovated recently (including electrical, plumbing, and central heating systems), new furniture, bedding, kitchen fully equipped with pots and pans and new appliances (dishwasher, washer, dryer, stove, large refrigerator and microwave). It has four bedrooms, three with double beds and one with twin beds. Three of the bedrooms are in the tower. There are two whole and two half size baths and a gourmet kitchen. 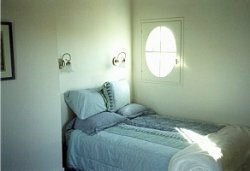 A Dutch door opens from the master bedroom to the terrace where there are a table and chairs. A small fountain bubbles away and many flowers grace the scene. From the terrace there is a view of old rooftops and gardens. It is a great place for intimate breakfasts and lunches, small barbecues in the evening or just lounging or reading. Kitchen - this large, bright oak beamed room has a gourmet kitchen, a dining area and a lounge. The preparation area has ample counter space and all new appliances (dishwasher, large refrigerator/freezer gas range and microwave oven). There are pots and pans of every description, new china, silverware and table linens (service for twelve). A large laundry - and storage cupboard along one wall with a new washer and dryer. 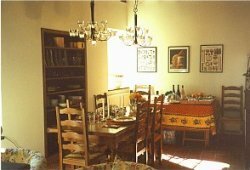 The dining area�- warm and sunny, with four large windows. The sideboard, table for twelve, shelves built into the two foot thick walls and two candle chandeliers make it a wonderful place to entertain. There is a magnificent red tile floor. A fireplace, two easy chairs and window seat complete the room. Your guests can keep you company while you cook or you can lounge there yourself. Living Room - this Moroccan style room has built in sofas and a window seat under the huge window that brightens the room throughout the day. The floor is made of the original 16th century red tiles. A brass coffee table, suspended lamps and a rug (all from Morocco) complete the ensemble. The original (and beautiful) circular wooden staircase originates in the living room and rises to the other floors. Master Bedroom Suite - the extraordinary master bedroom has a beamed ceiling and Moroccan rugs. There are built in desks for two with a double bed (with two sets of new bed linens), dressing table and a mirror. 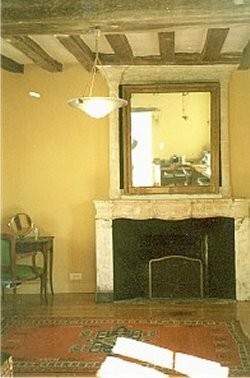 There is a baronial stone fireplace, surmounted by a huge antique mirror. The easy chairs and ottoman in front of it provide an intimate space for reading and talking. The enormous master bathroom - has a fireplace, many cupboards, a huge tiled bath/shower and a supply of towels. A separate WC - and basin, is on the landing. The other three double bedrooms - arranged in a tower, one bedroom to a floor. Bedroom 2 - on the first floor of the tower, is bright and airy with a new double bed, desk, fireplace and its own complete bathroom with a tiled shower. Bedroom 3 - on the next floor of the tower, has an antique iron trundle bed and a desk. It too has a fireplace. There are windows on both sides of this room. A bathroom - with a half size bath, is in the hallway. Bedroom 4 - this octagonal room on the top floor of the tower has an intricately beamed conical ceiling and a double bed. From it, there are superb views of the Abbaye and surrounding countryside. Balance to be paid - Full Rent 6 weeks pr to arrival.